With two boys who are actively involved in sports, we have to anticipate that sooner or later, medals and trophies will be won and the kids will be eager to display them. My son recently earned his first medal in a soccer tournament, and I wanted to find a fun way to display it so he can remember his accomplishments. I took a regular towel bar found at your local hardware or department store and attached it to the wall. Then, I looped the medal over it so it hangs nicely. A quick and easy way to display! As you can see, I have displayed his trophies on a shelf underneath as well. I think I might even add some type of quote or word art about hard work or success to finish it off! It’s important to remind your kids that with some hard work they can accomplish so much! How do you organized/display your kids’ trophies? Let’s face it…when you have kids, you do a lot more cleaning. These messy little creatures always seem to find a way to make things dirty! Unfortunately, all the cleaning supplies can add up. You can save money by making your own cleaning products! Some of them are so simple, requiring only two or three ingredients that you probably have around the house already, and they work just as good, if not better! Check out some of these DIY cleaning products and let us know what you think! Parents often don’t have a lot of time to prepare dinner, especially meals that have a main dish and a few sides. The crockpot is one of the best kitchen tools for busy families. It’s a safe way to leave food cooking for long periods of time, and the recipes can be as simple as throwing the ingredients in together! You can cut your cooking time in half, or even more, by using one. Here are some great crockpot meals the whole family will enjoy. Do you have a great crockpot recipe to share? Post it on our Facebook page and show us your delicious creations! It has still been summer weather here in Wisconsin, but in a week or too fall will be in full swing! It’s time for me to make sure the kids and I are ready with our fall wardrobe. You may remember reading how I dread changing the closets over. So, this year I am going in prepared. That is why I’ve created this checklist to use in their closets. That way I don’t end up buying more than I need. Pull everything out of closets and drawers. Check for coupons and online deals! 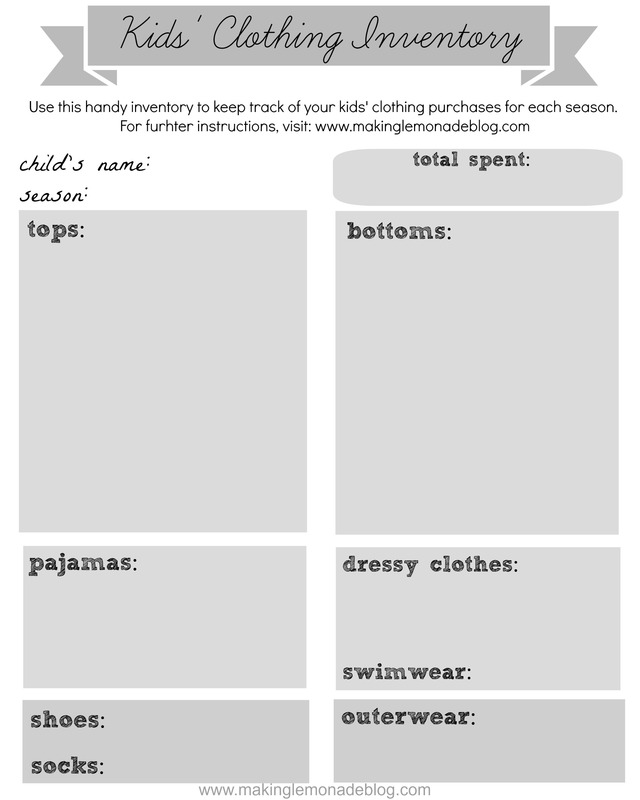 I hope your changing of the clothing gets done in an organized fashion and if you want to be super organized use this excellent Clothing Inventory Printable. The end of February is nearing so Spring is right around the corner… hopefully! I like to start my Spring Cleaning in March, because I know once the snow starts to melt and the days get warmer I like to spend more time outside. Feel free to use your favorite store bought or homemade cleaner; whichever will help you get the job done is the best! These are only a few of the items I want to tackle this spring. It is going to be a busy time, but the end result is a huge payout. While spring cleaning I also want to do some major decluttering! I’ve hit that time of life when I really need to simplify. There is a great series on A Bowl Full of Lemons that goes through things to think about when organizing and decluttering each room. I see a lot of trips to Goodwill in my future! One of my favorite parts of the new year is setting up our calendar with all the activities. The first obvious choice is choosing what type of calendar to use. Are you a fan of a paper planner, have one big one on the wall, or are you an online user. Make sure it is big enought to hold all the obligations of each person in your family. I personally use an online calendar for myself and my husband. I also carry a paper one that I can list things like shopping items, notes, to do lists, and menu plans. I have tried to go all digital but feel like I don’t have something that has everything set up the way I like. This method makes me do some of my work twice, but I always make sure the online one has every appointment on it. Remember when you are adding appointments to include birthdays, no school days, practices, sporting events, community activities, and more! Always remember to add your new events as they are scheduled, so that you will be prepared. Also, add items like family game nights, date nights, and vacations so everyone has things to look forward to. I like to use different color pens for the different people in my family. This helps me to quickly scan my calendar for a certain person’s obligations. As my kids get older it becomes easier to double-book them or accidentally schedule them to be to be picked up at two separate parts of town at the same time. Last year I talked about the daily sheet I use to organize each day. I keep this tucked in my calendar to help schedule my commitments for each day. This is a great tool to carry around for a snapshot of the day and what needs to get done or remembered. What tips do you have for organizing your calendar? One of my goals for 2012 is to get a little more organized. My desk and all the papers that pile on it are my greatest nemesis. You may remember my version of a household notebook from this last summer. I use that daily and I am continually adding things to it. It needed to have a companion though, so I created our own Home Management Binder. This has proved to be a great addition, especially to corral all those little notes that I am not sure what to do with but need a place to store. It has become a great place to store checklists and manage goals. The first step in creating a Home Management Binder is selecting the binder to use. I wanted something bold that I would be able to see at a moments notice. You may want one that you can customize if you are a crafter. I also gathered up some page dividers, section dividers and folders that are meant to go in binders. - Our Calendar: Here I have our daily sheet, a list of important dates including birthdays and anniversaries, and a printed calendar of our week. I manage our calendars online so I find that printing the upcoming week is a good solution. - To Do: This contains the master to do list, cleaning lists, and goal lists. I also keep papers that need to be taken care of in a folder in this section. - Menu Planning: I like to store a calendar where I list our upcoming menu selections in this part. I also have a list of favorite “tried and true” recipes here also. Sometimes this list makes it easier to quickly select items I would like to make. A grocery list also resides in this part of my binder so I can quickly note what is needed in the house. What sections do/would you have in your Home Management Binder?